We re-define “value portfolio” in this strategy by using a systematic, but flexible approach. 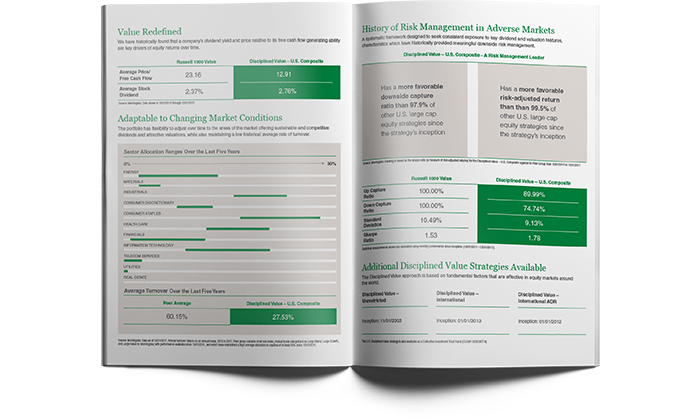 This allows us to actively find areas of the market that are offering superior dividends and valuations, which has historically driven favorable risk-adjusted returns and meaningful downside risk management. To provide competitive returns consistent with the broad equity markets while also providing a level of capital protection during sustained market downturns. The investment minimum for the portfolio is $250,000. The portfolio is managed by a team of five research professionals whose three key members average 13 years with the firm. High-quality, high dividend-yielding U.S. securities. Focus is on mid-to-large cap companies. Using a systematic investment process with a focus on mid-to-large capitalization companies, securities are selected annually based on free cash flow generation and earnings power, minimum dividend yield, dividend sustainability, and financial health. Holdings will consist of U.S. securities. The Manning & Napier Disciplined Value - U.S. (formerly known as U.S. Disciplined Value) Composite is a weighted average of discretionary separately managed accounts, and may include proprietary mutual fund accounts with a Disciplined Value - U.S. objective. Accounts in this composite must have a market value greater than $250,000 and tenure of at least one month under our management. This composite includes accounts invested in U.S. equities. The composite consists of diversified portfolios of mid-to-large capitalization stocks based on attractive free cash flow yields and attractive dividend yields. The proprietary criteria used include screens based on dividend yields, free cash flow yields, bankruptcy risk estimates, and market capitalization. Portfolios are typically rebalanced annually according to these criteria. At such time, we may use our discretion to attempt to minimize commission costs and realized capital gains. Prior to April 2017, accounts with a market value below $1 million were not included in this composite. Net-of-fee returns are calculated based off of the effective fees of the accounts in the composite. They are after brokerage commissions, reinvested income, and advisory fees, but if applicable, before custodian costs and the fees of the investor’s Personal Financial Advisor. Also, accounts subject to solicitation fees may incur as much as 0.15% in additional expenses. Fees will vary with size and circumstances and these fee differentials would impact returns accordingly. Past performance does not guarantee future results. All returns were earned in USD and are stated here in USD. All data are subject to revision. Performance for periods greater than one year is annualized.